GREETINGS FROM NOT JUST MANCHESTER BUT GREATER MANCHESTER. In this Newsletter we'll go on a flying tour of the 10 Greater Manchester districts, with a recap of selected photos from the Eyewitness in Manchester Image Collection. THE CITY OF MANCHESTER is where we'll start. Manchester city centre is the financial and cultural centre of the north west of England. Manchester's shops, shopping centres businesses, hotels, banks, financial institutions, government departments and much much more make Manchester second only to London. But Manchester hasn't always been as prosperous as it is today: The 20th century has seen a sharp decline in traditional industries of cotton, heavy engineering and manufacturing - many inner-city districts of Manchester still suffer from poverty and unemployment. The present Manchester city council, together with Marketing Manchester and other agencies, are promoting economic regeneration - and it seems to be working. The three universities: Manchester, MMU and UMIST play an important economic as well as educational role. The City of Manchester often takes the lead role among the 10 Greater Manchester districts, for instance in its hosting of the Commonwealth Games. 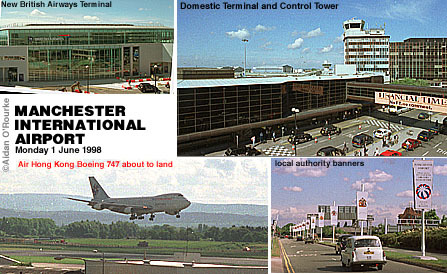 Manchester Airport is a good example of inter-council co-operation as it's co-owned by the 10 Greater Manchester authorities. The City of Manchester is at the heart of the conurbation - and its southern suburbs run 12 miles south to the Airport, whose second runway now extends into Cheshire. Manchester shares its western boundary with our next Greater Manchester district, which we'll visit now, moving in a clockwise direction. 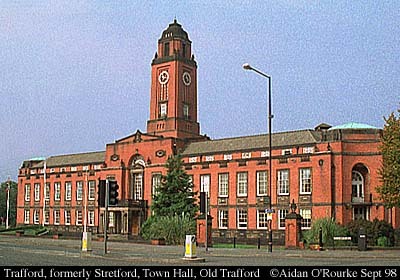 THE BOROUGH OF TRAFFORD is just 15 minutes walk away from Manchester Town Hall, extending from within sight of the city centre to the leafy lanes and green fields of Cheshire some 12 miles to the south and west. 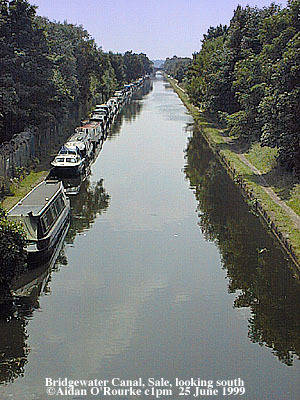 The River Mersey divides the Borough in two - separating the Cheshire towns of Altrincham, Sale and Carrington from the Lancashire districts of Stretford, Urmston, Flixton, Old Trafford and Trafford Park. 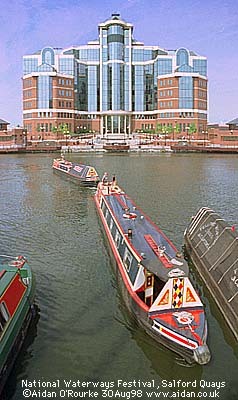 The Bridgewater Canal runs through Trafford from north east to south west. It was built two centuries ago, but nowadays used mostly by pleasure boats. Dunham Massey is one of my favourite places in Trafford - the hall and park are run by the National Trust. 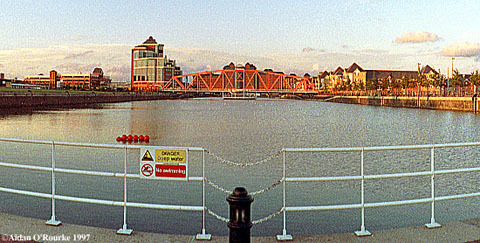 Sale Water Park is another, area of greenery, located next to the River Mersey, which runs east-west through Trafford. The affluent southern suburbs of Bowdon, Hale and Halebarns are pleasant, tree-lined and expensive. They're convenient for the the Airport, located just across the M56 in the City of Manchester and for the city centre, linked by Metrolink trams from Altrincham. Old Trafford is the place that made this district famous, as it's the home of Manchester United, and also the Lancashire Cricket Ground. Nearby, the recently regenerated Trafford Park buzzes with manufacturing industries and at the far end of Trafford Park, you'll find the recently opened shopping colossus - The Trafford Centre. Trafford Wharf faces Salford Quays across the Ship Canal, which marks the western boundary of Trafford, taking us to our next GM district. THE CITY OF SALFORD is separated from Trafford by the Ship Canal and from Manchester by the River Irwell. 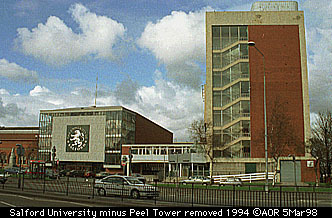 The University of Salford is situated about one mile west of Manchester city centre and has an extensive campus by the meandering River Irwell. Just beyond the University is the vast high rise complex which was built on the site of "Hanky Park", the old commercial and residential heart of Salford, destroyed by WW2 bombs and 1960's town planning. Salford Quays is the showpiece of Salford, and is one of my favourite places - the former Docks have been transformed into a dazzling quayside waterworld of office buildings, apartments and hotels. 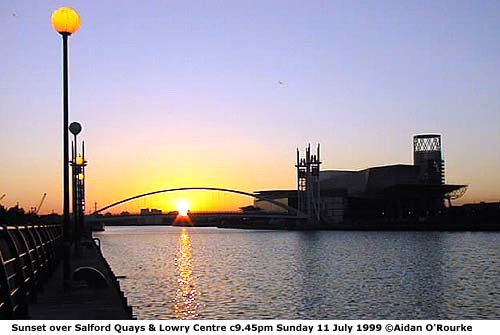 In 2000, the Lowry centre opens, forming a stunning central attraction at the heart of Salford Quays. The Lowry is named in celebration of local artist, LS Lowry, though I'm not sure what Mr Lowry would have thought of this honour! Let's not forget outlying districts, which were incorporated into the City of Salford in 1974, including Eccles, Irlam, Swinton and Pendlebury and Worsley. 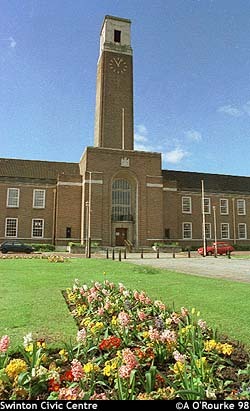 Swinton has the impressive Civic Centre, formerly town hall, built in the 1930's. 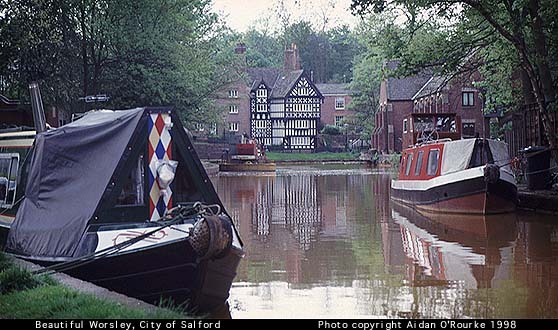 Worsley is famous for the Bridgewater Canal and is now a prime residential area. THE METROPOLITAN BOROUGH OF WIGAN, adjoining Salford and Bolton is the only GM borough not to have a border with the City of Manchester. The name of Wigan once conjured up in my mind images of coal mines and whistling steam trains, but nowadays you'll find a clean and modernised environment. The new Galleries shopping centre and market is the centre piece of the town. 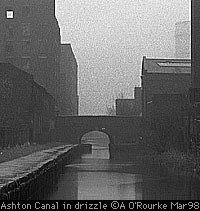 A short distance away is Wigan Pier - famous from the book "The Road to Wigan Pier" by George Orwell. There's no pier, but you'll find an award-winning museum complex on the banks of the Leeds-Liverpool Canal, including the recently-opened Museum of 20th Century Life. Other attactions in the Borough include Pennington Flash - the largest in a series of lakes formed by mining subsidence - a drop in the ground level due to collapsing mines. The Flash has been developed into a country park, with watersports facilities and a wetland area for birds. Other towns in Wigan Metropolitan Borough include Leigh, Ince, Abram and Ashton-in-Makerfield. THE METROPOLITAN BOROUGH OF BOLTON is the next district in line on our tour around Greater Manchester. 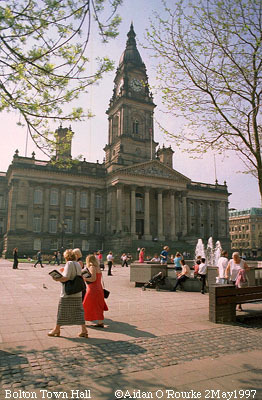 Bolton town centre is 12 miles north west of Manchester city centre and is dominated by the Town Hall clock tower. Nearby is the recently opened shopping centre, built onto the old Market Hall in a modern but attractive style. Bolton's wealth in past times was built on cotton - there are still some cotton mills to be seen - many of them now house light industries. 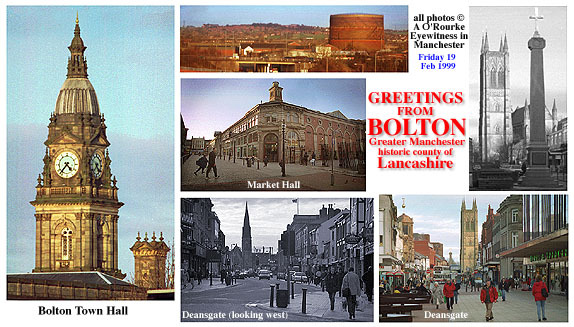 The name of Bolton is synonymous with the Octagon Theatre. 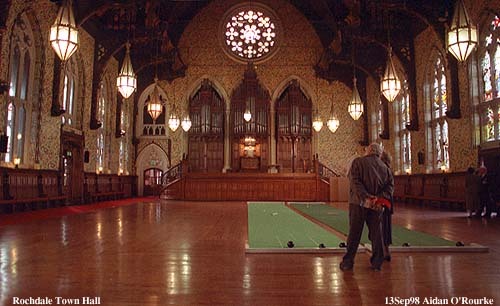 Other attractions include the Central Library, Art Gallery and Museum and the Clock Museum. Travel north of the town and you'll reach Winter Hill and Rivington Pike. This is one of my favourite viewpoints, as it's the only place in Greater Manchester where you can see both Manchester city centre and the Irish Sea. Below you is Horwich, home of Bolton Wanderers and their state of the art new home, the Reebok Stadium. 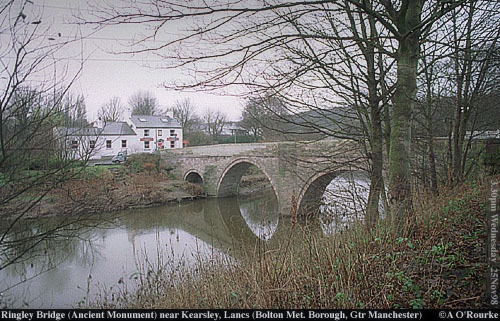 Travel south east along the A6 and you pass through Farnworth, and the former mining town of Kearsley - which has a superb medieval bridge. To the west of Bolton town centre beyond the M61 is the town of Westhoughton. To the east is Little Lever, leading to the next district in our tour. THE METROPOLITAN BOROUGH OF BURY is situated about 6 miles north of Manchester city centre, and unites under one authority the towns of Bury, Ramsbottom, Tottington, Radcliffe, Whitefield and Prestwich. 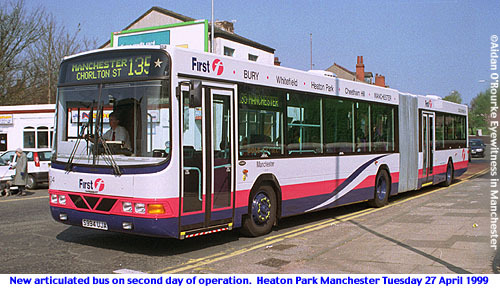 Bury town centre is linked to Manchester by Metrolink trams which run from a purpose-built transport interchange. You can also take an articulated 6 wheel bus to the city centre. 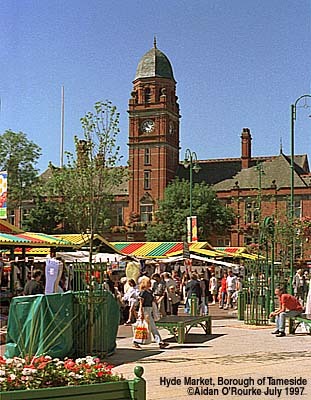 Other attractions in the town centre include Bury Market and the Museum and Art Gallery. To the south of Bury are Radcliffe and - very close to Manchester - Prestwich. THE METROPOLITAN BOROUGH OF ROCHDALE is next in line on our tour. 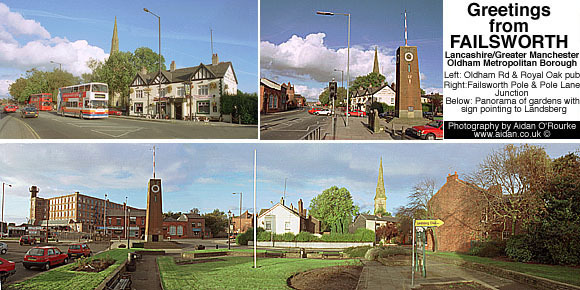 Middleton is its most southerly point, separated from the north Manchester suburb of Blackley by the River Irk. 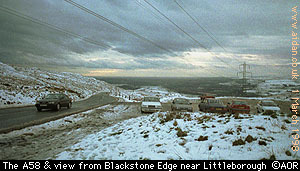 The six townships of the borough are Middleton, Heywood, Milnrow, Rochdale, Wardle, and high up in the hills leading to Yorkshire - Littleborough. 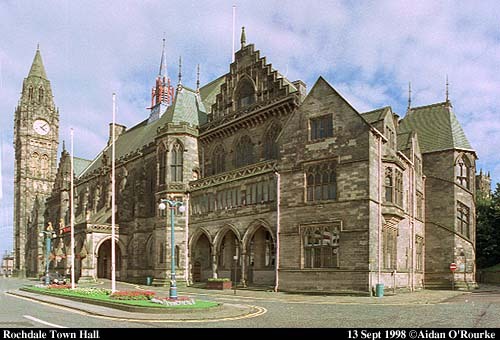 The main attraction in Rochdale town centre is in my opinion the superb Town Hall - smaller, but in many ways more appealing than Manchester Town Hall. The River Roch runs through the town past the town hall. You won't see it, as it flows underneath what's said to be the widest "bridge" in Europe - looks to me more like a long street built over the river. Rochdale has long associations with the cotton industry - and the singer Gracie Fields. Her modern-day successor, Lisa Stansfield, is another famous Rochdale star, now no longer resident here. Like other GM districts, a journey through Rochdale takes you from the foothills of the Pennines, with their dazzling views over the conurbation, down to lower lying areas bordering on the city of Manchester. 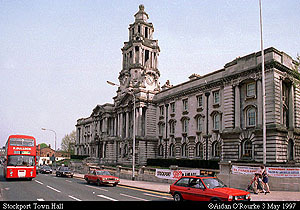 THE METROPOLITAN BOROUGH OF OLDHAM is Rochdale's neighbour to the south, and like Rochdale is one of the "crescent" of cotton towns. 100 years ago, Oldham was a "boom town" as featured in an exhibition at Oldham Museum. The cotton industry drew entrepreneurs and workers from far and wide. The legacy of that time is still visible in the red-brick mills that stand at prominent hillside points around the town. The town centre is built on a hill, offering superb views between the buildings in all directions - the Civic Centre - a white multi-storey block - occupies a prominent position and can be seen for miles around. Bordering on Manchester are the lower-lying districts of Chadderton and Failsworth. Royton lies to the north. Close to the town centre are the hill-top suburbs of Werneth and Sholver. Travel east from the town, over the hill, and you enter the picturesque Saddleworth district - an area of stone houses, steep hills and bleak moors more characteristic of Yorkshire than Greater Manchester. Travel down through the towns of Delph, Dobcross and Uppermill and you reach the border of our next district. THE METROPOLITAN BOROUGH OF TAMESIDE runs from the hills and moors of the Pennines down to the low-lying suburbs adjoining the east of the City of Manchester. The borough takes its name from the River Tame, which meanders from north east to south west. The old Cheshire-Lancashire border runs along the River Tame, as marked on the A57 bridge linking Denton and Hyde. Hyde, Stalybridge, Mossley, Mottram and Broadbottom lie within the old boundary of Cheshire - Denton Audenshaw, Droylsden and Ashton are on the Lancashire side of the Tame. Some think that people ought to be using Tameside, but they continue to use the county names in addresses. 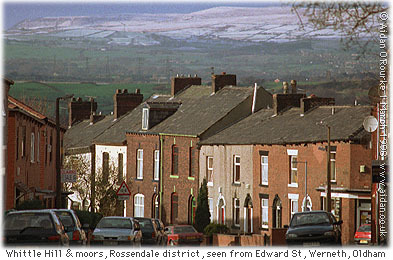 Mossley adjoins neighbouring Saddleworth, and has a similar character of stone - built houses, hills and dales. Lower Mossley is set deep in a valley, while ten minutes away above Mossley Brow is Hartshead Pike, with fantastic views north, west and south. Stalybridge is surprisingly historic and and full of character - the town centre is undergoing extensive redevelopment - the Huddersfield Canal - which some decades ago was filled in - will be reopened, enabling boats to go from Yorkshire to Manchester once again. Ashton-under-Lyne is the bustling "capital" of this eastern borough. 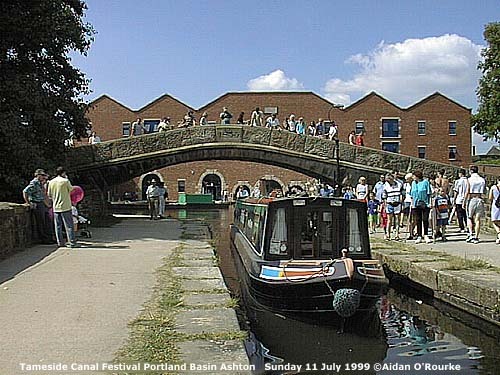 The market, several museums and the Portland Canal basin are the main attractions. Dukinfield has a superb town hall and park, Hyde has its town hall and market above Hyde, Werneth Low is another place with superb views. 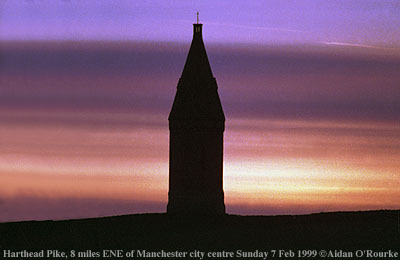 Travel east up the M67 and you reach Mossley, with its hilltop church, with views up the spooky Longdendale Valley. Going west along the M67 takes you down through Denton (see Denton EWM feature)- former hat-making town and into Manchester. Audenshaw is famous for its huge reservoirs. Droyslden is the most westerly area in the borough, bordering on the east Manchester suburb of Clayton. THE METROPOLITAN BOROUGH OF STOCKPORT lies south of Tameside and south east of Manchester - the town centre is just 6 miles from Piccadilly. Like neighbouring GM boroughs, Stockport has its hilly eastern districts - Marple, Romiley and part of Werneth Low, and its low-lying suburbs of Hazel Grove, Bramhall, Cheadle, Gatley and Heald Green. Like Tameside, it comprises areas on either side of the old Cheshire-Lancashire border running along the Tame and the Mersey. The Mersey starts in the town centre at the confluence of the Goyt and the Tame - and ends 35 miles west in Liverpool. Areas north of the Mersey include Reddish and the leafy suburbs of Heaton Norris, Heaton Moor and Heaton Chapel. 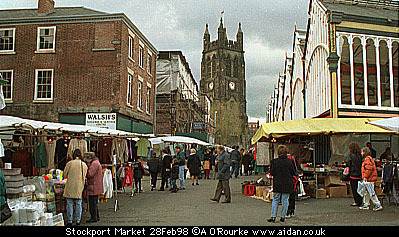 Stockport town centre is set in a valley, overlooked by steep hills to the north and south. Growing up in Stockport, I remember it as a grey and grimy place with a strong feel of the 19th century. The shopping centre - uniquely built above and along the River Mersey - was the first major post-ware development in the town. Old mills and factories were knocked down, new office blocks and blocks of flats were built, obscuring to some extent the old character of the town. More recently, the market area is being redeveloped, in harmony with its historic character. One and a half centuries later, the stupendous brick railway viaduct is still in daily use, carrying the Manchester - London railway line high above the town centre. 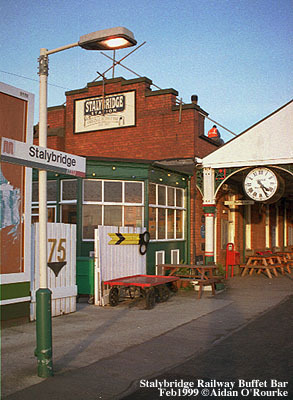 Within the borders of Stockport you go from Reddish, typical of a Lancashire cotton town with its neat rows of terraced houses and dominating mill - via Edgeley and Cheadle Heath, where I grew up - to the leafy suburbs of affluent Cheadle, Bramhall, Cheadle Hulme Gatley and Heald Green. Heald Green leads us back across the Manchester City boundary to the Airport, where we'll end our tour of the 10 Greater Manchester districts. It's an area of amazing contrasts and attractions - many of them hidden - at least to some people who live here. It's only when, like me, you've lived in a country where most buildings don't go back more than fifteen years and where all the tourist attractions can be covered in two weeks - that you come to appreciate what a rich and ever-surprising place Greater Manchester is. It's not perfect - there are many social problems and some of the historic character of the area has been lost through destructive and sub-standard post-war development. But it's a real place - people are genuinely warm and welcoming - and the attractions of the industrial heritage and of popular culture are in my opinion far more interesting than the "chocolate box" towns on the traditional tourist itinerary. If you have any questions, or have anything to add, contact me. AND NOW A ONE OR TWO NEWS STORIES FROM THIS WEEK ..
A BOY WAS DROWNED this week after swimming at an unauthorised bathing place and getting into difficulties. Today's MEN carried a report about how youths are risking their lives by jumping into the freezing cold water at Salford Quays. They are urged not to go swimming and to stay away from the water. But nowhere in the discussion does anyone draw attention to the fact that there, to my knowledge, no designated outdoor swimming places anywhere in the local area. In France & Germany, outdoor swimming in pools and lakes is commonplace - here you encounter only "No Swimming" signs, or rangers who tell swimmers politely, or not so politely, to get out of the water. In past decades there were outdoor swimming pools in Platt Fields Park, at the Galleon Disbury (I went there as a child) and at Castle Mill, near the Airport. Why have they all closed? It is natural for children - and adults -to go swimming outdoors in hot weather -if we fail to provide this important leisure facility, children will ignore our warnings and go swimming at dangerous and unsupervised locations - with sometimes tragic results. Bring back the outdoor lido! TWO TEENAGE GIRLS were found guilty yesterday of murdering 71 year old Lily Lilley, who lived in Failsworth. The girls burst into tears when the verdict was read out. Manchester Crown Court heard how they gagged the old lady, who then choked to death. The two girls put the body in a wheelie bin, pushed it through the streets of Failsworth and dumped it into the Rochdale Canal, where it was subsequently discovered. As they're under 18 years of age they can't be named (though this may be overturned) and will be "detained under Her Majesty's pleasure", i.e. indefinitely. A WOMAN HAS GONE MISSING IN TAMESIDE - Blind and deaf Edna Stretton was a familiar face in and around Ashton town centre. She has not been seen since Monday. Yesterday in I saw a police helicopter hovering over Ashton town centre - officers delivered a message via loudspeaker, asking people to contact the police if they'd seen her. The search goes on, using mountain rescue teams. WIN THE LOTTERY AND BUY A PUB - That's what Kevin Stone, landlord of the Moss Tavern, Droylsden, has decided to do following the lottery win of £180,010 he shared with his wife Elaine and seven others. Sounds like many a drinker's dream - your own pub. We'd like our own Chinese takeaway! 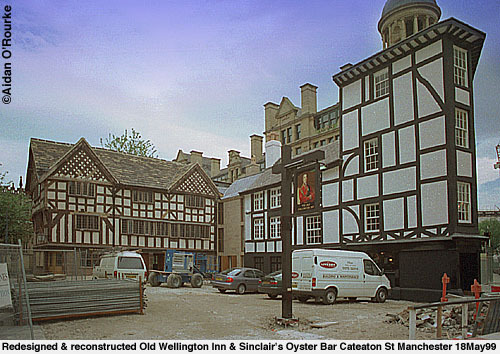 Here's a quick look back at how the Shambles used to look and how it is now. THERE WILL BE NO EYEWITNESS IN MANCHESTER update this weekend. This is to allow for essential maintenance work on the Eyewitness in Manchester computer. Following that, Eyewitness in Manchester will be going on his annual "wakes week" holiday, but don't despair - I'm preparing midweek & weekend picture updates - uploaded in my absence - and I hope to send an electronic picture postcard during my trip to Europe.